He drove a heroic race to finish second after an opening lap collision with Kimi Raikkonen, who finished third, had knocked him from pole position to last. 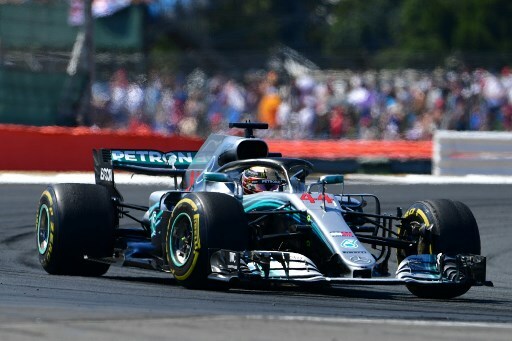 Lewis Hamilton struggled to hide his disappointment on Sunday as he avoided a post-race interview and ignored one of his Ferrari rivals after finishing second to Sebastian Vettel in the British Grand Prix. Hamilton drove a heroic race to finish second after an opening lap collision with Kimi Raikkonen, who finished third, had knocked him from pole position to last. The Englishman clearly blamed Raikkonen, who was handed a 10-seconds penalty, for the crash and found it difficult to face the Finn or accept an apology. “My team did an amazing job this weekend,” said Hamilton, when he was, eventually, interviewed on the podium and after the two Ferrari men had departed. “This is the greatest race of the year and the greatest crowd,” he said. “I am sorry I could not bring it home for you today. I will not give up. Believe me, I will not give up. Hamilton’s body language as he kept away from Raikkonen in the pre-podium room and during the champagne spraying told its own story. He clearly felt Ferrari had gained from an opening lap crash, in the same way they had when Vettel collided with Hamilton’s Mercedes team-mate Valtteri Bottas on the opening lap of the French Grand Prix two weeks ago. In both cases, the penalty did not seem sufficient to satisfy Mercedes, or their drivers, after their races were wrecked by rivals’ mistakes. Hamilton was on pole on Sunday and made a poor start before his brush with Raikkonen who apologised and accepted the blame. Vettel now leads the title race with 171 points, eight ahead of Hamilton on 163 while Raikkonen is third on 116.